ARLINGTON, Va. — If home is where the heart is, as far as Arlington County is concerned, art is where the people are. Originally a part of the “10 miles square” parcel of land surveyed in 1791 to be the nation’s capital, Arlington has spawned some of the D.C. area’s most creative and forward-thinking attitudes toward art projects for the past four decades, ranging from music, to community sculpture, to providing creative workspaces for artists. This week, Arlington Art Truck has launched, under the guidance of Cynthia Connolly, an influential photographer, letterpress artist and curator known for her contributions to D.C.’s 1980s punk rock scene. “The Arlington Art Truck is a van that is basically a mobile toolbox,” said Connolly, whose official title is Arlington Cultural Affairs Special Projects Curator. “An artist will drive somewhere with me, we unload the project on a street, or park, or sidewalk in Arlington, and we invite people to interact with the artist,” she said. In shepherding the initial offering of Art Truck, Connolly is showcasing an eye-catching and ear-catching piece, using sound in sculpture. 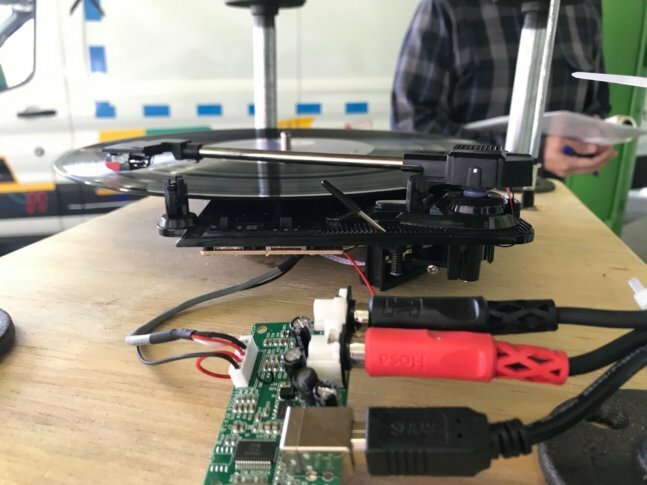 “This is Bipedal Soundscapes, which is a bicycle-powered, five-tiered turntable system, designed by Emily Francisco and Alex Braden,” Connolly said. Participants pedal an exercise cycle, which powers five record players simultaneously, creating a cacophony. Connolly said Arlington has a long history with artists — and groundbreaking sounds. “In the ’80s, when rents were cheaper in Arlington than D.C., a lot of musicians moved to Arlington,” Connolly said. “Not only because the rents were cheaper, but because the houses were separated — they weren’t row houses — so you could practice in the basement and not disturb your neighbors,” she added. In addition to Dischord, punk and new wave labels based in Arlington included Simple Machines, TeenBeat Records and Wasp Records. Now, in a county and region well-known for its traffic-clogged roadways, Connolly said it makes sense to bring art to people. “For the public, it’s easier for them to catch it at the farmers market or walking down the street — the idea of Art Truck is to learn something about the artist, and something about the county in three to 10 minutes,” she said. While some might question the importance of art in the politically-driven D.C. community, Connolly doesn’t.